I am cleaning our old church for a friend this week and next week. She is on vacation. It is a drive, but I plan to take the kids, do the job, and head to the state park there on B-U-T-ful Flathead Lake! I also hope to pick up the pieces of this week and start over Monday with adventures on foot, a picnic in the local park and hopefully some exploring! Right now we are looking forward to having a cook out tonight with some friends from the Truth Project we led. Library on Tuesday... having that one normalcy and picnic on the front steps was fun. It has been a rough week and so the other favorite would be God's revelations and answered prayer through it all. It is newsletter time of month! Need to start on that :-) 501c3 will be at the top of the list for a while as well! Finished History lesson plans! (that should be under favorites!) Now I am working on Science. Was blessed with some free A-beka Science and history books that will be great for Brenden and Brooke! (Ashley already has one) I am looking forward to incorporating them into my plans. I'm also reading this one to help me relax in the evenings, funny how my life parallel's the main character's right now! Peace in the turmoil, vision clarity and articulation, a new name for our KOGMissions.org website/the coorporation (long story), and discernment. I'm having trouble keeping my brain in my e-SBS studies, praying for clear thinking and remembering in that as well. What a wonder that our strength is always renewable in the Lord, all we need to do is come to Him. 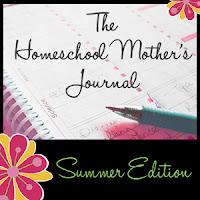 Blessings to you for a wonderful homeschool/summer vacation week! P.S. I am not a very good speller and now spell check isn't working in IE, please forgive my icky grammar and pray Firefox and Blogger will make nice again!